Cindy Says take exotic style to the Extreme with this stunning slinky Leopard boot. 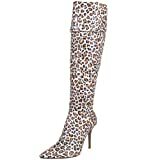 The animal printed upper is ultra-stylish; the stiletto heel and pointy toe are just an added bonus. The lightly padded insole will keep you comfortable, while the half-zipper will make for easy on and off accessibility. Whimsical, sophisticated footwear that’s both cutting edge and very wearable continues to be the trademark of this up-and-coming label that strives to address the diverse lifestyle of the modern woman.